My Interview in Mint. Click on the image to read the Offline version. Icing on the cake is, it’s published on my Birthday. I’m just going through your other websites. Awesome man! You are good at both technical and business. Thats a rare combination! All your websites are serious and seem to have many loyal users. I’m sure it would have taken you a many hours to build such a loyalty. All the best for your future stuff, Shabbir! Thanks for those wishes Karthic. Hi Prasanna, thanks for those kinds words. Thanks Amrik for the feedback. I saw the article and than this site ! I hope to learn and earn form it. Great that you found the site through the news because editors have messed up the url with an extra s on my main site. 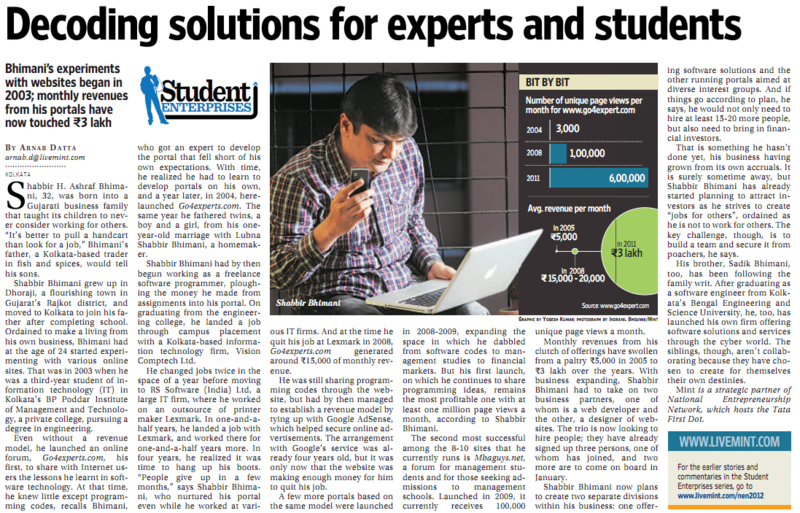 Interviews in print/online media surely helps in getting known. But, I wonder why there’s no single mention of imtips? IMTips is still not among the top revenue generators for me and they mention in order of revenue.